This rather fabulous box set contains every track that Stray recorded for Transatlantic over a five year tenure with the label, encompassing five full album, various B-sides and a few obscure rarities, generously spread across 4 CDs and with a very informative booklet to boot. 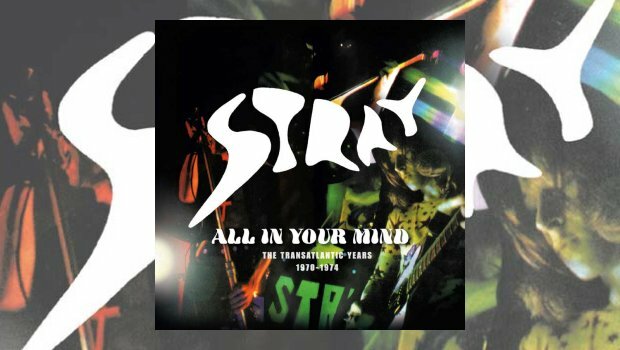 Stray were a band that were a perennial support band, including such high points as supporting Kiss on their first U.K. tour and also opening for Rush on their U.K. bebut dates in 1975 (apparently Neal Peart was a fan of theirs). This set includes the albums Stray (1970), Suicide (1971), Saturday Morning Pictures (1971), Mudzanas (1973) and finally Move It (1974), the highlights being the Suicide and Saturday Morning Pictures albums, both of which are sweeping in style and featuring some great material. This set is far superior to the Time Machine anthology released on Sanctuary Records in 2003, simply because each album is here in full and the flow is far stronger than on that compilation. Also, if you are wondering about how this compares to those expanded reissue from 2003 then don’t worry as the sound has received a 24-bit digital remastering by Ben Wiseman to give a clear, well separated sound, and all those bonus tracks from those albums are here on disc 4, apart from the BBC version of Sister Mary from Saturday Morning Pictures and the live BBC disc from Move It (which is still available elsewhere). This is a great way to capture the first five Stray Albums in one nifty little package. The Suicide and Saturday Morning Pictures discs both reveal Stray to be a far superior act than the ‘support band’ tag might suggest with some great guitar work throughout from Del Bronham and fine vocals from Steve Gadd. Also a big surprise is how strong the Mudzanas and Move It albums are with such class songs as Changes, Oil Fumes and Sea Air and Hallelujah, this is a great trip back into the past that reveals a very underrated band and some great songs that feature social commentary around those days, and best of all is the news that Pye Records are to release a second anthology, Fire and Glass, covering the Stand Up and Be Counted, Houdini and Hearts On Fire albums in full, on the 25th November which will mean fans can own a complete set of Stray’s early years, all in great remastered sound, which is a cause for celebration and re-evaluation of this very talented and oft overlooked band. Another nice touch are the four songs that Stray recorded for Pye in 1969 and included here to show the great promise of things to come. A truly fabulous set from the masters of the reissue at Esoteric, buy with confidence and be enthralled by this great band. 15. Do You Miss Me? 07. How Could I Forget You?